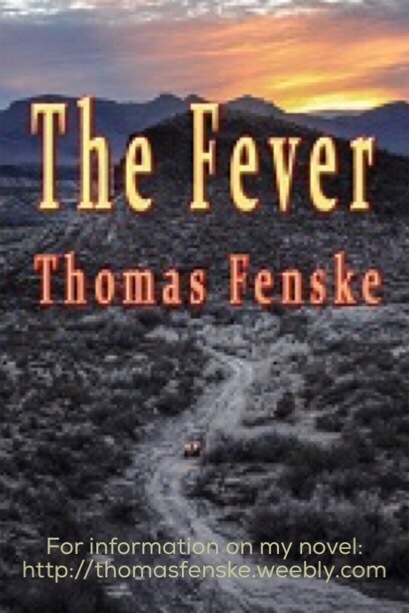 My first novel, THE FEVER, is still chugging along and was just favored with a new review. If we were having coffee today I’d have to tell you I am very happy to see you. Last week I talked about my upcoming eye surgery on my cataracts, so I thought I should give you a little update. It is nothing short of amazing. And that’s just one eye. Of course, my right eye was my dominant eye, it always has been, but I’d been depending more and more on my left eye, although I knew it was rapidly deteriorating too. The doctor suggested I have the right lens removed from my glasses but I actually think I function better without that … since my left eye, even corrected, is pretty bad. I was just standing on the front porch. There is a small store across the street from us. I can close my left eye and see the small, lit “OPEN” sign clearly. If I cover my right eye, I CAN’T EVEN SEE THE SIGN. That’s uncorrected. I can see that there is a store there, as I can with most other big things. It is like looking through smoke and haze. Understand, this eye is about 50% better than my right eye had become. I had become pretty used to my deteriorated vision. I was still driving up to two weeks ago, depending on the weather and the light conditions and how my eyes seemed to be functioning at the time — some days I could see better than on other days. Since the surgery, my wife had been reluctant to let me drive again, but I told her, really, I can see so much better than I could even see two or three months ago. The new situation is not without its adjustments and pitfalls. I still have what they call “floaters” … including one I was calling a dragon’s claw, shifting back and forth just out of my central vision, a bit like a hair on an old projector lens at the movies. It has diminished over the last several days, now more like a spider or fly, dancing around. The doctor said it is not uncommon and should likely fade over the next couple of weeks. The nature of my eyes precluded a complete adjustment … although the eye tested at 20/20 for distance, I still need enhancement to read. Although this seems a minor adjustment, it is actually more than I anticipated. I’ve worn progressive lenses for almost 20 years … basically trifocals without lines. I used to joke they were like being young again. Now, I don’t need glasses for distance but have to relearn what I used to do years ago before the progressives and keep reading glasses handy. I haven’t had to do that in a while and it is different now with things like tablets and smart phones. I’ll know more when I have the other eye complete. But considering I struggled to even see the screen to type last week’s dispatch, I can see the screen clearly now with minimal strength reading glasses, although I think I’ll need to take it easy because even now I can detect eye strain as my left eye struggles to help. Not complaining, mind you, as I know this is temporary. Eye two scheduled for early December. He really needs some sales to help pay for all these related medical expenses! At my last checkup my eye doctor, an optometrist, told me it was coming. I first noticed a few changes early last Summer. It seemed to come and go. I pushed through the minor inconvenience because of our daughter’s upcoming wedding. Stupid, I know. This is something that doesn’t go away. Vitamins or exercise don’t help. I just didn’t want it to possibly get in the way of the nuptials. What got me was how fast it started to deteriorate. In the final month before the wedding, I could tell it was changing pretty quickly. After the wedding, I finally got an appointment. Yep, he said, time to head to a specialist. Of course, I then had to wait. In my case, although I have cataracts in both eyes, my right eye is significantly worse than my left eye. Unfortunately, my right eye is my stronger eye, always has been. And in the last month both have been going downhill fast. I finally surrendered my car keys to my wife the other day. Oh, I think I can still drive okay, as long as I know where I’m going, but my depth perception has suffered too and she got tired of me running over curbs and such. My worry was someone possibly walking in front of me. I can see big stuff okay, but it is like driving in a misty early morning fog … all the time, everywhere, and bright lights like headlights and street lights are often exaggerated and blinding. That famous painting Starry Night? Welcome to my world. I go in for surgery on the right eye this coming week. It is perhaps the most common surgical procedure these days. Very routine. That’s why I mentioned the anecdotes earlier. I’ve heard a lot of them. I’m both dreading the surgery (as one does) and looking forward to it. Then I get to do it again, on the other eye. The doctor told me I’ll really see how bad the left eye is when the right eye comes back on-line. One of the saddest things for me is the fact that I have to miss National Novel Writing Month this year. I’ve done it every year since 2011. My two published novels were NaNoWriMo projects. I enjoy NaNoWriMo, it is fun and I’ve made some lifelong friendships from the random writing buddies I’ve collected over the years. But NaNoWriMo takes commitment and with surgical disruptions and … well, hardly being able to see the computer screen (struggling even writing this! ), skipping it this year is a no-brainer. Maybe I’ll write the third book in the series NaNo-style in January. One of the good things that will come out of this is the fact that they can actually do proactive corrections. The flip side is that it is almost always out of pocket … insurance should pay for all this stuff but they balk at actually doing something helpful and forward-thinking. They’ll replace the cloudy lens with a buck basic replacement, sure, but for a few bucks more and what is basically some minor LASIK I can expect some real improvement. But it is an easy sell for the medical industry … the prospect of better eyesight, not just as good as before with glasses but BETTER … well, that is hard to pass up. And given what they are already doing, it just makes sense in the long run. Can I afford it? Not really, but can I afford to NOT do it? Well … not really. So think about me this Thursday. Feel free to comment to me about your experiences. I know you will anyway, so I might as well invite you. It helps. It really does. Oh, and remember the cost and remember those two books hanging around out there on Amazon (and other popular sites listed on my web page). Hint, hint … a few more sales might help offset the cost for me, so tell your friends too. (“Always play for sympathy, my boy,” an actor-mentor once told me).